On Saturday I took my inflatable kayak through part of Gray Canyon on the Green River from Nefertiti to Swaseys Rapid. It was a nice relaxing day on the river, and I also got to find some new rock art, plus revisit some sites I have been to before. I have been to this large boulder containing a few pretty large petroglyphs before, but I can never pass up the opportunity to revisit a site when I am near. 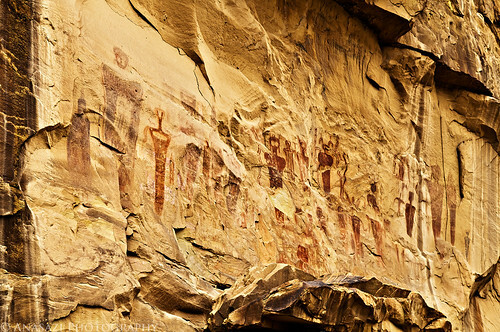 Ancient ghostly figures painted on a wall overlook Thompson Canyon in the Book Cliffs. 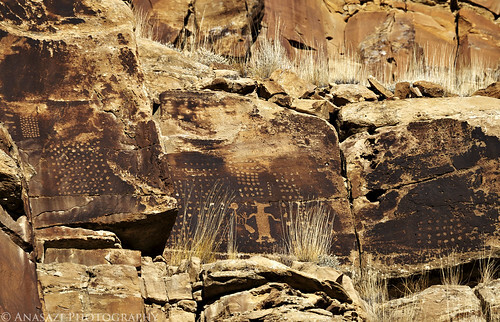 It took me a little while to finally find these petroglyphs after two different trips searching for them. I was just about to give up again this time when they caught my eye. I wasn’t looking quite high enough to find them originally. Some believe that this scene depicts Coyote in the act of placing the stars. According to one Hopi creation myth, Old Spider Woman provides Coyote with with a sack filled with stars. After climbing to the top of a mountain he begins to distribute them neatly in the heavens, including creating the well-known constellations. Soon, he grows tired of this work and picks up the bag to throw its contents into the sky. This is the reason why many of the stars are not arranged in an orderly fashion. 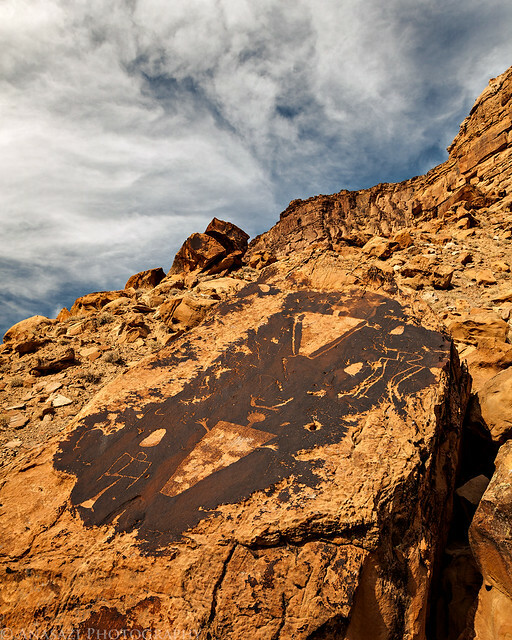 Looking at this petroglyph site you can see many dots surrounding the coyote-like figure that could represent the stars and the bag-like object that is held in one of its hands.